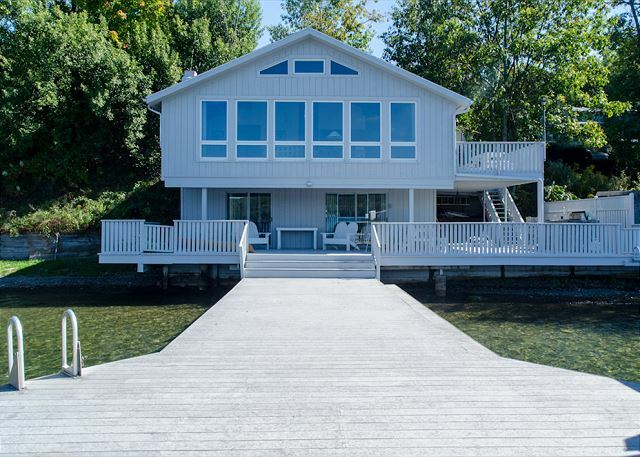 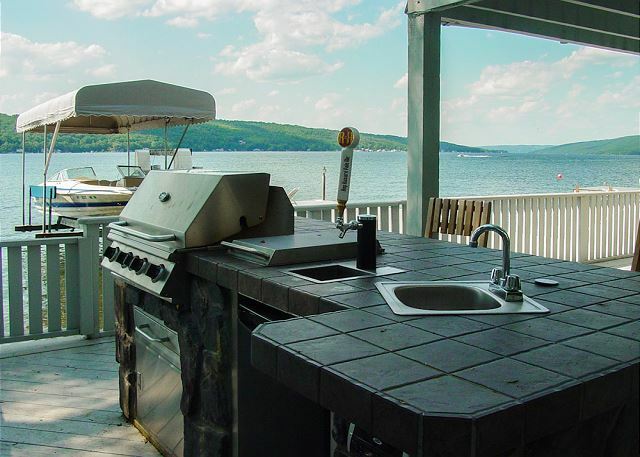 Enjoy the breathtaking lake views, and entertain friends and family on the expansive decks! 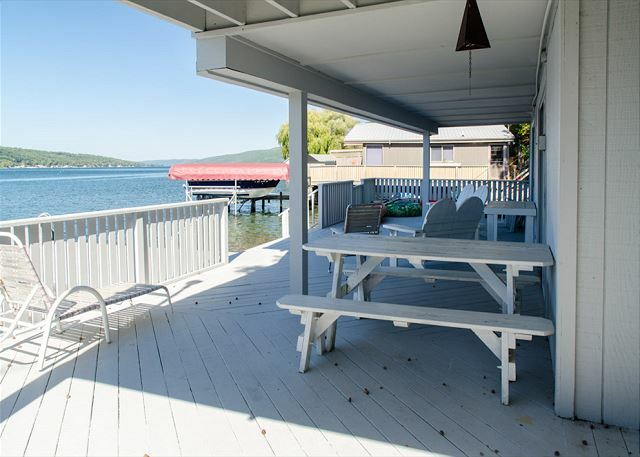 Relax and enjoy lake living at “The Sunken Cork” With three spacious bedrooms and two full bathrooms, this water’s edge cottage provides exceptional comfort for eight guests. 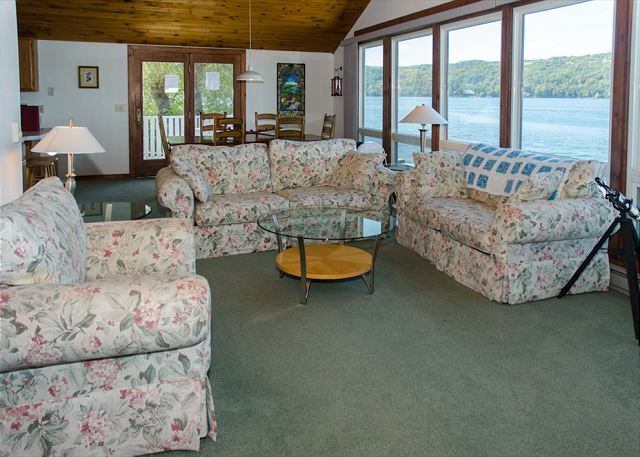 The main entry into the cottage leads to an open dining and living room. 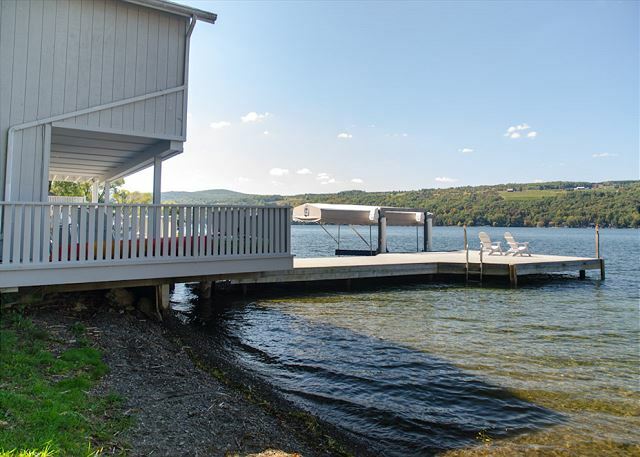 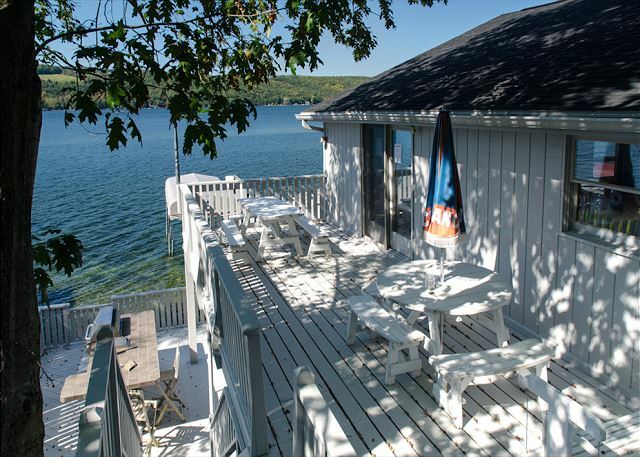 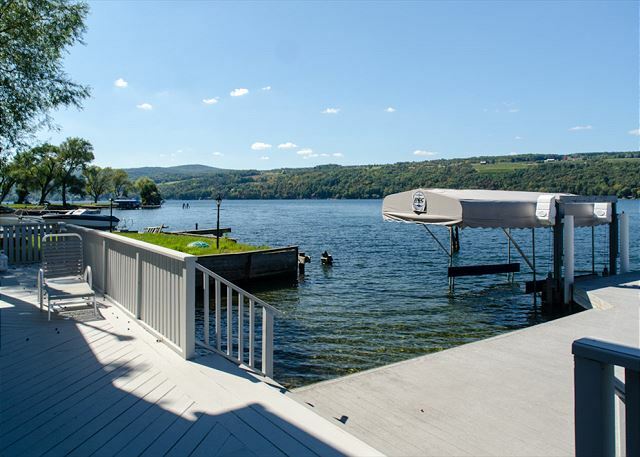 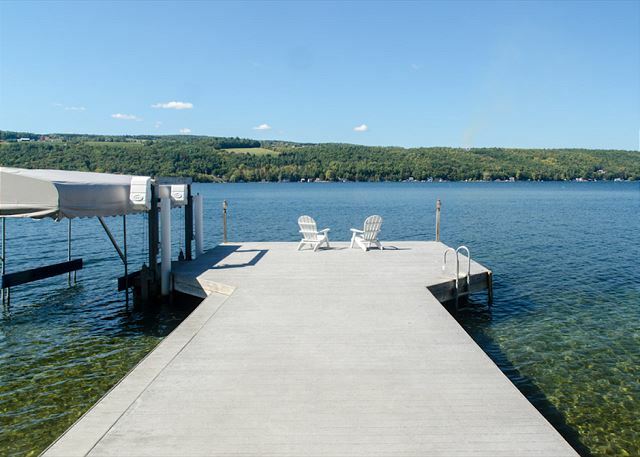 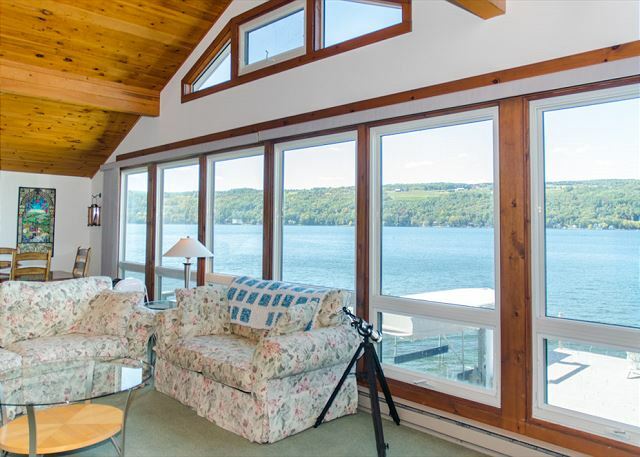 Large picturesque windows line the entire lake side and offer an exquisite view of Keuka Lake. 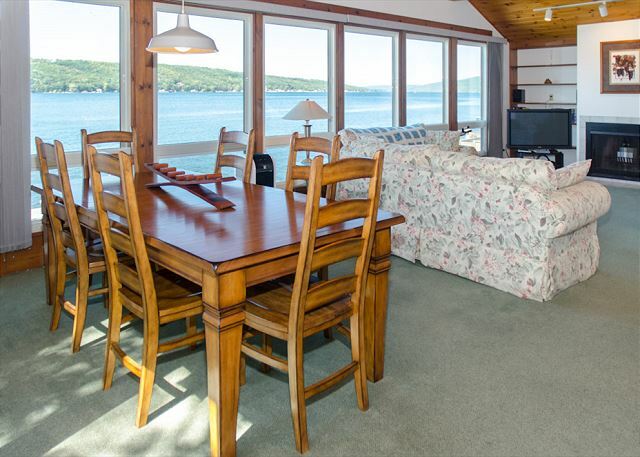 Curl up on the couch and enjoy a good book while listening to the water lap against the shoreline! 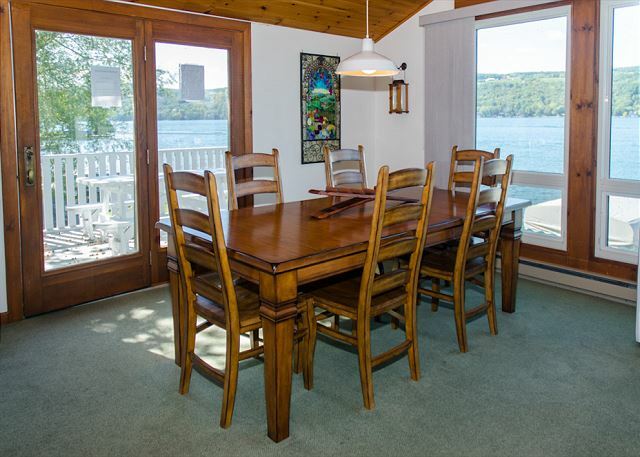 Just off the dining area is a charming kitchen, fully equipped for all your cooking requirements. 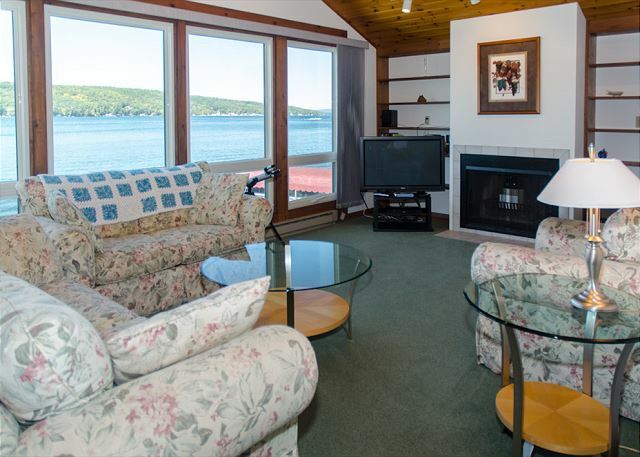 To the far side of the living room, you’ll find the master bedroom with a 4 poster Queen Size bed. 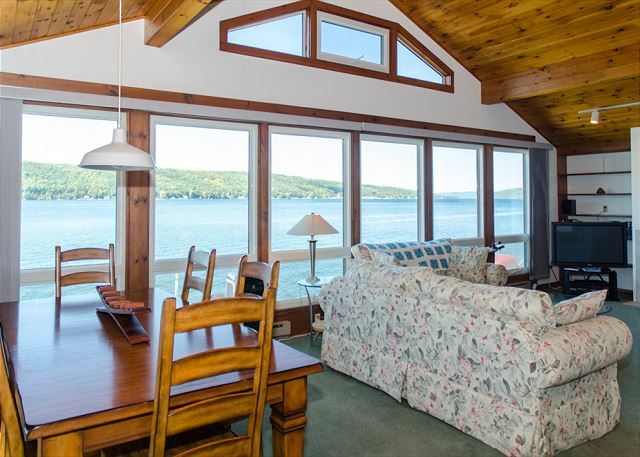 A full bathroom with shower, washer, and dryer is located in the hallway at the top of the stairs between the entry and lower level. 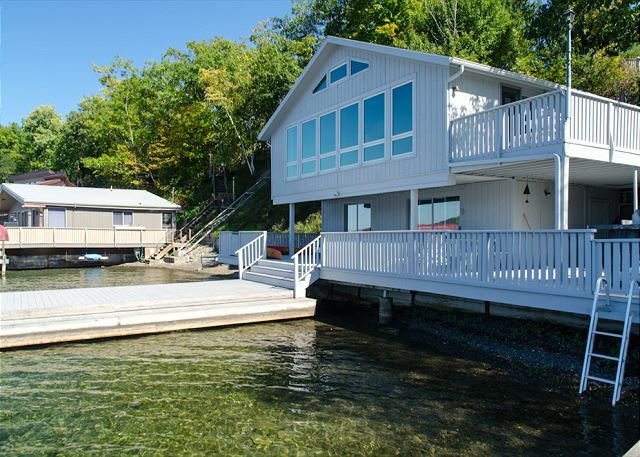 The fully finished basement features two additional bedrooms, each with a Queen Size bed that boast gorgeous lake views. 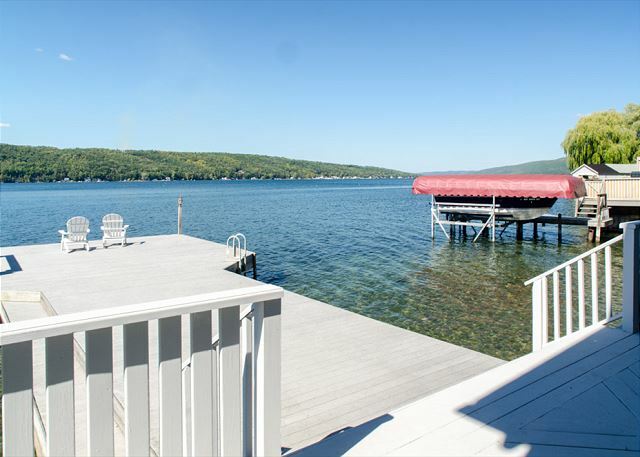 Pull the curtains open in the morning and watch the sun dance on the water while you’re still in bed. 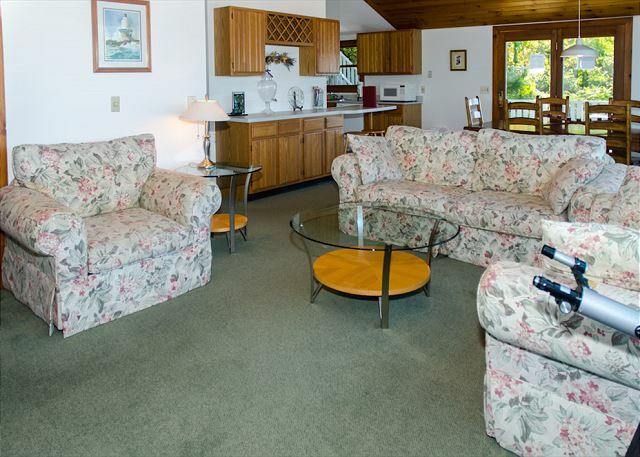 These bedrooms share access to a second full bathroom with sink, commode, and shower. 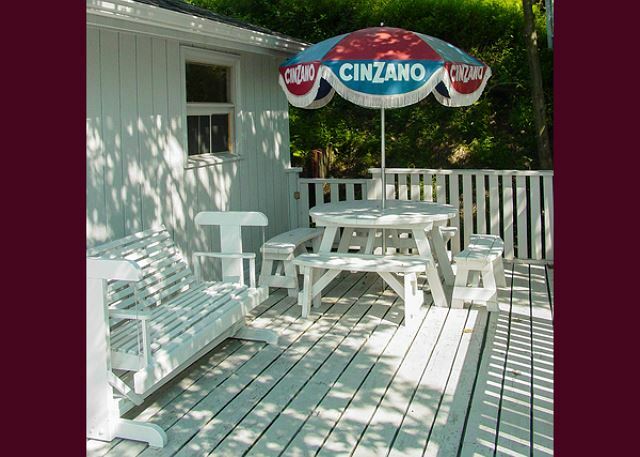 Sliding glass doors off these bedrooms lead you outside to the lower deck, where Adirondack chairs await your relaxation. 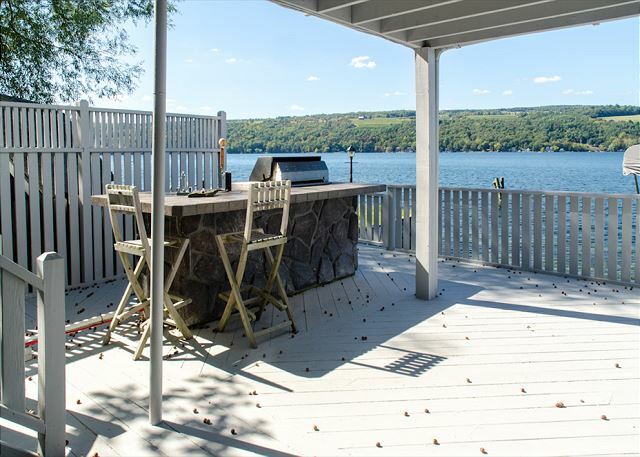 Enjoy the day sunbathing on the dock, entertain at the outdoor kitchen/grill, or take out the kayak that is available for guests use. 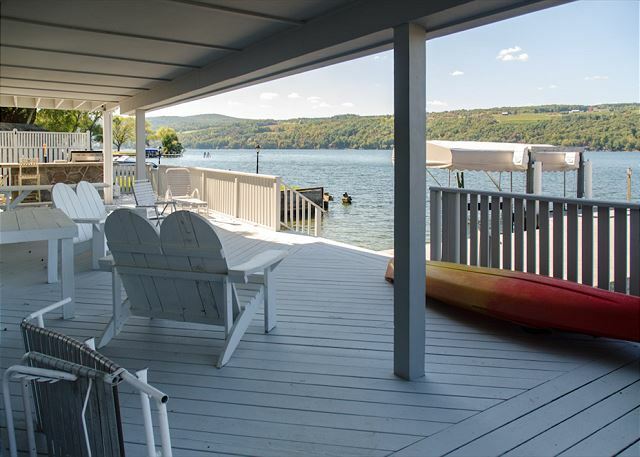 “The Sunken Cork” is located just minutes away from the small town of Hammondsport, which is known for its small town charm, historic downtown shopping, great dining, and delicious ice cream. 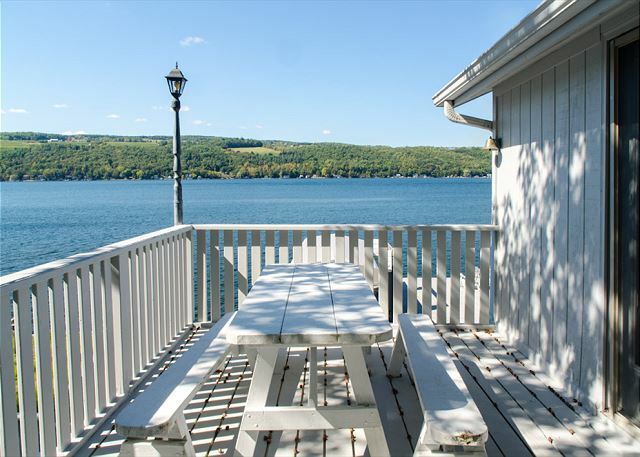 You can also start your Keuka Lake Wine Tour right here, just to see how many corks you can sink – your memories of a wonderful vacation on Keuka Lake will start right here!